Welcome to the second edition of "Spotlight On." Today, I had the honor of getting questions answered by a ribbon guru that I met nearly eighteen months ago when I first decided to give the hair bow "thing" a try. 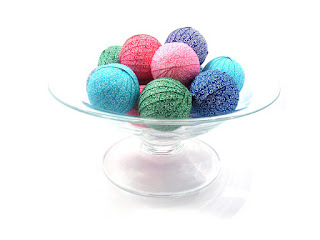 Wendy of All About Ribbon runs one of the best Yahoo groups and is a great ribbon enabler! I know that my bank account doesn't hold nearly enough as my eyes would like and my ribbon collection is far bigger than I will ever be able to use. I seem to be described as the hippy “Martha Stewart” a lot by friends and family. I would rather make gifts and decorations for our home than buy them. I have two toddlers and a wonderfully supportive husband that tolerates the constant crafting project explosions. 2. What made you decide to get into the crafting boutique business? When we found out we were expecting our second miracle we also found out how much daycare was. They are only 18 months apart so the reaction was something like this, “Bam! Wowzers! Really?!? Oh, DEAR!” Someone was going to have to work at home which translated to Mommy was going to have to work at home. I started looking at low cost businesses that I could hit the ground running with. After all, I only had 8 months to find something, master it, and turn a profit that we could at least use for grocery and bill money! I found hair bows and ran with it. My initial investment was about $150 in supplies. I quickly found myself immersed in ribbon and bows and luckily orders to go with it all! However, I kept getting custom orders from my clients that wanted ribbon that just wasn’t available. The requests included Horse, Ants for watermelon bows, and Guitars. It sounded so much simpler in my head than in reality to say, “I’ll just have it made!” Luckily I was born with a tenacious spirit, more stubbornness than it should be legal to have, and the inability to take no for an answer, so now I have a ribbon company. It’s a strangely wonderfully journey, but I still look around and wonder how on earth did I get here? 3. What do you sell? 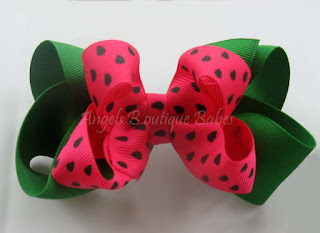 I sell mostly custom printed ribbon and other supplies for crafters with a focus on hair bow makers. I still sell bows but my focus has shifted to local customers and custom orders. In the next year I plan to re-launch a lot of my hair accessories online again. Should be another great adventure! 4. Where do you sell, online and off? 5. How do you juggle selling your items and your personal life? You know those free moments where you sit down and relax because everything is done and you watch your favorite TV show? We don’t have those! If I am sitting, I may be watching what’s on but 99% of the time there’s ribbon in my hand. With two small children, the ribbon and bow businesses, and the day to day grind there’s not much free time. Weekends we try to focus more on doing some fun things together. We make it a rule that we laugh together everyday. A lot of my friends are people I have met that are other bow makers and crafters. It’s lovely to say “grosgrain” and have someone know what you are talking about rather than the more common blank stare. 6. What is your favorite thing to create? Hair bows, I still love experimenting with new ideas. There’s no limit. I really enjoy picking out the new ribbon designs as well, but that’s purely for selfish reasons. It’s a kick be making a bow and think that ribbon with (fill in the blank) would really just put the bow over the top… and know you can do it! 7. What are your long term goals for your creations? I want to continue doing new and unique prints for ribbon that isn’t available currently. I love when I open all the shipment boxes and you see something and it’s YOURS! It’s amazing. We are also planning to launch some new products in the next 1-2 years that should be really exciting. I am already excited! 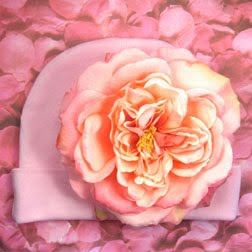 For all the hair accessories I make I want them to have a “home” online. I love www.Etsy.com but I also want them to have their own website. 8. Any advice for someone just starting out in the creating community? Find something you have a passion for. Throw yourself in headfirst and learn anything you can. Evaluate where you want to go with it. Is it a hobby or are you going to make a business out of it? Refocus, and find your niche! Do you want your business to just bring in extra pocket change, or are you looking to take over the world? You know, any answer to those questions is fine. Everyone has different goals and paths to get there. When I graduated high school I wouldn’t have been caught dead saying, “I want to be a WAHM and I am going to build a RIBBON EMPIRE!” but I wouldn’t trade any of it for the world! Now, how would YOU like to win some ribbon? I thought so! Wendy has offered to give one lucky winner a $25 gift certificate to buy ANYTHING on her site! SOOOOO, without further ado, here is what you have to do! 1. Go take a peak in her shop and/or website and come back here and let us know what your favorite item is! 2. Follow this blog and leave a message. If you are already a follower, just leave a message! 3. Sign up for the newsletter on her site! I signed up ASAP and she is always giving her newsletter followers a heads up on sale and special things! 4. Heart her shop and come back and let me know. In your comment, please let me know what your Etsy ID is! Good luck! And may the Ribbon Force be with you. I think that you are going to need it. I found Wendy's group through Mika and haven't looked back. Though I do love the swirls, I think the uniqueness lol is that a word?! is what keeps me coming back. The guitars, the tattoo, horses etc. It makes my creations that more special because of her designs! Wendy lured me in over a year and a half ago and my ribbon collection has just kept growing!! Swirls!?! i am obsessed with her FABULOUS Swirls and can't get enough of them!! I LOVE Korking all of her Beautiful prints and creating something FANTASTIC from Wendy's gorgeous ribbons!!! One of my fave ribbons from wendy is her tattoo ribbon. It's retro and hip! But then the swirls are classic and beautiful. It was so nice to hear a little bit about Wendy. I found her yahoo group about a year ago and love it. My favorite designs have been her swirl ribbon and the great selection of colors. Also following your blog Christie! Wow thank you Christy for letting us find out how our enabler got started.. lol I am so glad I found you girls.. all of you ARR girls have helped me grow in the last year! And some ribbon goddess has filled soooo many wants for ribbon its awesome.. wel I think so but DH has other opinions lol love ya ladies! Where every kid gets to be unique in boutique! I am a Swirl lover!! I was so happy to learn more about Wendy. I ♥ ♥ ♥ all of the AAR Ribbon. I have learned so much from her Yahoo Group. Her ribbon is TDF. I believe that she "IS" really Martha Stewart. I didn't realize how young AAR is. Loved the description of balancing time. That is how it is with me too. From all the other comments it sounds like Wendy needs to put a copyright on the swirl ribbon. Ribbon enabler...hmmm...that's a NICE way to put it!! lol I love, love, love AAR!!! The quality is amazing and you couldn't ask for someone better to work with. Wendy is so helpful and down to earth! I have NEVER found anything that I don't like! I also love how Wendy allows us to give her input on what WE REALLY want!! From the amazing swirls, to the rockin' tattoo print ribbon, to the sweet ballerina's! I also love that Wendy is so open about her life, her kids, even her car accident...being that we both have children with a disablity, it also is an encouragement that as mom's we can balance ANYTHING!! Thank you Wendy!! The 7/8 Cupcake Cutie on Pink Grosgrain Ribbon is so cute! l follow your blog via google friend connect. Argh I want them all! but fav would have to be the turquoise white swirl printed grosgrain ribbon! I love those adorable Paris birds on the pink ribbon - very fun! So hard to pick just one item. I do really like the 7/8 Light Navy with Pink Swirl Printed Grosgrain Ribbon. 3/8 Azalea with White Swirl Printed Grosgrain Ribbon is my favorite, but it was a difficult choice! Nice Etsy shop, lots of selections to choose from. I love the 7/8 Cream with Black Swirl Printed Grosgrain Ribbon! I like the 3/8 Turquoise with White Swirl Printed Grosgrain Ribbon 5 Yards. Great stuff! I heart the etsy shop (ghainskom). I really like it. I signed up for the newsletter! I LOVE the paris birds, they are SO cute!! Off to heart the shop now!! I love the Brown horses on pink grosgrain ribbon from her website! I signed up for the all about ribbon newsletter. I really like: 3/8 Apple on Pink Grosgrain Ribbon 5 Yards from the store site! I like the purple with white swirl grosgrain ribbon! I am a blog follower through blogger. My username is T's Craft Corner/Trina Reed. I really like the yellow with black swirl ribbon in her store! It would have to be the swirly ribbon I think. The cream with black swirls! 3/8 Orange with Black Swirl Printed Grosgrain Ribbon 5 Yards is lovely./ So is Spring Moss! Love! I love the Shocking Pink with White Swirl ribbon. I just made dresses for my two girls and this would match the fabric perfectly!! Liking the Orange with Black Swirl Printed Grosgrain Ribbon! I've never seen patterned grosgrain ribbon before. I have to pick the swirls. I love them all. I love * Cute Creaturesribbon! What a wonderful interview and good idea for a giveaway! I quite like the 3/8 Yellow with Black Swirl Printed Grosgrain Ribbon 5 Yards: http://www.etsy.com/view_listing.php?listing_id=37152427 from all about ribbons shop. That sure is a beauty. It's very funky, the yellow and the black! i love the baseball on blue ribbon...so girly for a bow...but not..i love it! My mother in law works with flower arrangements and this would be an awesome win for her. Thanks for the gift card giveaway. I am following your blog on google friend. I love the 3/8 Flamingo Pink with White Swirl Printed Grosgrain Ribbon 5 Yards. Love the spotlight on Wendy!! I AM HEAD OVER HEELS IN LOVE WITH ALL OF THE RIBBON AT AAR! THANKS WENDY!!!!!! ALSO I hearted Wendys etsy shop my etsy id is BrazzleDazzle! Wendy is one of my favorite ribbon enablers!!! I am now a follower of your blog! Yay for Wendy going about and making her dreams come true. I Love Wendy's Ribbon...and of course The SWIRLS are my favorite....they are so pretty I just love looking at them. I favorite ribbon of Wendy's has always been the horse. Now I am in love with the Paris Birds. I don't think there is anything I Don't like on her site. She is truly a wonderful lady! I just signed up to be a follower! I am hoping to learn even more from all you wonderful ladies! 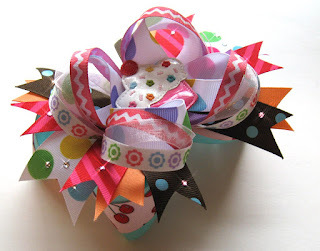 I am also in wendy's yahoo group and LOVE LOVE LOVE the swirl ribbon!! I am crossing my fingers that I can win that $25, I want some more 1 1/2 inch swirl!! Thanks!! Love the Spring Moss with white Swirl ribbon! Thanks so much! Wendy has an awesome website. I have 2 favorites: swirls & horse prints. :) I already subscribe to the newsletter & have hearted her etsy store. Wow! Star of David's ribbon? that's a hard one to find. I'd pick it as well as the Cow on White Grosgrain. It's hilarious! I am following this blog. I have added All About Ribbons to my favorites in Etsy. I like the pretty 7/8 Pink with Red Swirl Printed Grosgrain Ribbon 5 Yards. I thought I better sneak in here real quick and say thank you everyone for taking the time to read my little interview. I am so glad you all can find lots of ribbon to love! I have that same problem! :) This has been a lovely experience! I'm a follower of STitch N Love! I hope I'm not too late to participate! All the ribbons are so pretty but I like the color of the lemon lime with white swirls one best! my favorites are STILL the swirl ribbons in ALL colors but I like her snowflake pattern and her fireworks pattern also! Very different from everything else out there. Oh, and I just signed up for her newsletter!!! I like /8 Shocking Pink with White Swirl Printed Grosgrain Ribbon 5 Yards. I love the 5/8 Moss with White Swirl Printed Grosgrain Ribbon 5 Yards! I love the 1/2 inch Unbreakable Plastic Headbands.